The ASIS show floor is awash with new access control products, but Stanley Security's Iris Reader integrated door might be the deadliest. Mixing an iris reader with an automatic sliding door makes a cool booth gimmick but has little practical use in real life, and may actually do more harm than good. We break down this crazy idea in the following note. 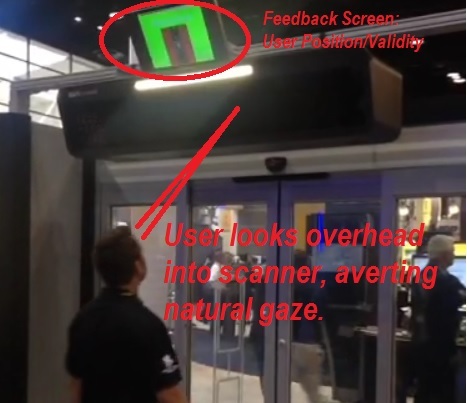 So a user approaches the door, the integrated scanner rapidly 'reads' the irises, and the door simultaneous slides open and deactivates a privacy film so the user can see through the opening. In the Vine clip, you will notice that Stanley marches 5 or 6 'valid' entrants through the opening, demonstrating users do not need to break stride in order to be quickly read through the opening. Polarized Privacy Glass: The door glass is treated with an electrically sensitive film that obscures 'outsiders' from seeing inside when active. In Stanley's mockup, a valid user triggers the controller to turn off the film, making the glass transparent during pass-through. Iris Reader: Rather than the standard PIR or a card reader, the door is triggered to open by reading occupants irises. Eyelock is Stanley's iris reader partner, with reading performance claims of up to 50 different users per minute, or one user approximately every 1.2 seconds. Sliding Door Operator: The least exotic aspect of this demo is a Stanley Sliding Glass Door Operator, ubiquitous in retail entrances and high-traffic openings. The controller is configured to open the door and turn off privacy glass upon a valid iris scan. This forces the user to look in a direction different than the direction of travel. Stumbling, running into doors/other occupants, and tripping over obstacles is a certainty. Looking somewhere besides where you are walking is simply a horrible idea. Notice how precisely aligned the user must be in order for the reader to work. In the first attempt, Stanley's demonstrator approaches the door in a perfectly natural manner, but is not read. He must break stride, stop, backup, and then re-approach the reader a second time to be validated. Even in the sterile booth environment, the reader only correctly validated (trained, pre-enrolled) staff ~70% of the time. Tailgating is a huge enemy of access control, even for traditional swinging doors that close quickly behind a valid user. On the floor, a Stanley representative suggested "the door slams shut so rapidly, tailgating is impossible", but this is clearly not the case. Even if it were, this is asking potential customers to willingly operate machinery that can smash people, regardless if they are valid users, intruders, or innocent bystanders. A sliding glass door typically travels great distances and is timed to close slowly -to avoid slamming users- but for a 'security application', the slider must do the opposite. In the field, the constant cycling of the door action takes its toll on sliding openers. Timing is typically the first attribute to change, and frequently used sliders can take minutes to close or one door section may stop traveling before the other. New sliders work great, but can fall out of adjustment after mere days in the field. At best, this application is a maintenance hog. Not only would the door need frequent adjustment, but the reader itself would require proper positioning and cleaning. With changes in sun position, glare or backlighting could cause significant problems. At worst, it would result in user injury and increase the tailgating risk. One one hand, if the door slams closed too quickly, a distracted user could be caught between the doors. On the other hand, if the door is tweaked to close more slowly, it potentially allows anyone/everyone through it. At least, it would be a nuisance. Given potential users may not always be willing or capable of properly authenticating, actual field deployment is dubious.